Carved from a single piece of wood, this spectacular mask illustrates the powerful storytelling tradition of the Yoruba culture. Here the king's horseman (a chief) makes his last journey in life. The king has died and now the horseman must commit ritual suicide to follow him. He accepts his duty with pride and honor, proudly retaining a staff (opaga) and a walking stick (oba) in his hands. When the Not-I bird (seen perching on top of the mask) calls to him that death is coming, he acknowledges its song. Most people deny the bird's call by answering "Not I" when asked, "Have you heard death coming?" Hence the bird's name. The sculptor's skillful and ingenious use of hierarchical proportion advances the story of the king's horseman. The horseman is the largest and central figure. Minor characters, such as the market women who dress him in ceremonial garments, other women and men playing the drums and calabash, and his bride are depicted in smaller scale. All encircle the horseman in a striking spectacle. This type of mask is used in the Epa festival held annually in March. The week-long event's purpose is to ensure fertility and prosperity in the community. Worn by the strongest man in the village, the mask weighs more than 100 pounds. At the base of the mask, a frightening visage called Ikoko forms the helmet. 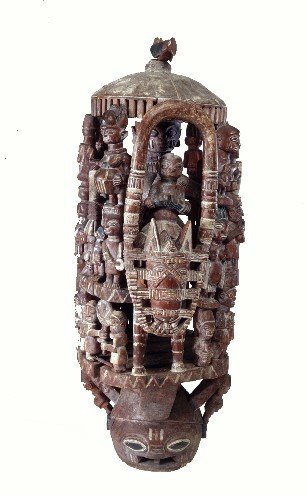 The work is in the style of Yoruba's greatest carver, Bamgbaye of Odo-Owa (ca.1895-1978), an Efa Priest and Chief Alaga. Bibliography: Cleveland Museum of Art, 2002, ob. 1991.165; Hahner-Herzog, 1998, p.43; Soyinka, 1975, pp.9-82; Willett, 1993, pp.246-247.